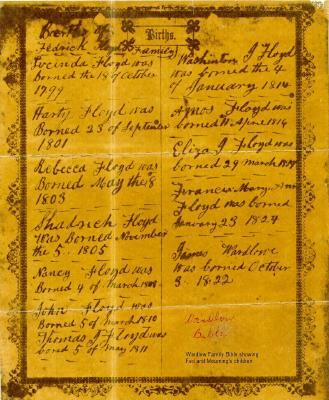 [S7] Henderson, Lillian., Roster of Confederate Soldiers of Georgia. [S67] Ferrin & Peter, Bourbon, Scott and Nicholas Co., KY (1882),. [S85] Unknown subject, unknown repository, unknown repository address. [S88] Unknown subject, unknown repository, unknown repository address. [S90] Unknown subject, unknown repository, unknown repository address. [S91] Unknown subject, Military Record, State Archives of Georgia, GA.
[S94] Unknown subject, unknown repository, unknown repository address. [S97] Unknown subject, unknown repository, unknown repository address. [S98] Wardlow Bible, Bible Page, MVW File, 100 Beach Dr. # 1801, St. Petersburg, Pinellas County, FL. [S99] Unknown subject, unknown repository, unknown repository address. [S109] Unknown subject, State Archives of Georgia, GA.
[S120] Unknown subject, unknown repository, unknown repository address. [S121] Cedar Hill Cemetery, Cemetery, 2003, MVW file, 100 Beach Dr. # 1801, St. Petersburg, Pinellas County, FL. [S151] Unknown subject, unknown repository, unknown repository address. [S152] Unknown subject, unknown repository, unknown repository address. [S153] Unknown subject, unknown repository, unknown repository address. [S154] Unknown subject, unknown repository, unknown repository address. [S155] Unknown subject, unknown repository, unknown repository address. [S156] Unknown subject, unknown repository, unknown repository address. [S158] Unknown subject, unknown repository, unknown repository address. [S159] Unknown subject, unknown repository, unknown repository address. [S162] Unknown subject, unknown repository, unknown repository address. [S163] Unknown subject, unknown repository, unknown repository address. [S165] Unknown subject, unknown repository, unknown repository address. [S166] Unknown subject, unknown repository, unknown repository address. [S167] Unknown subject, unknown repository, unknown repository address. [S168] Unknown subject, unknown repository, unknown repository address. [S171] Unknown subject, unknown repository, unknown repository address. [S172] Unknown subject, unknown repository, unknown repository address. [S173] Unknown subject, unknown repository, unknown repository address. [S174] Unknown subject, unknown repository, unknown repository address. [S175] Unknown subject, unknown repository, unknown repository address. [S179] Unknown subject, unknown repository, unknown repository address. [S194] Unknown subject, unknown repository, unknown repository address. [S195] Unknown subject, unknown repository, unknown repository address. [S197] Unknown subject, unknown repository, unknown repository address. [S198] Unknown subject, unknown repository, unknown repository address. [S344] Unknown subject, unknown repository, unknown repository address. [S348] Unknown subject, unknown repository, unknown repository address. [S352] Unknown subject, unknown repository, unknown repository address. [S475] Watson, compiler, Abstracts of Deeds of Northampton Co., NC (n.p. : n.pub.. Hereinafter cited as Northampton Abstracts. [S491] Jerry Floyd, "Jerry Floyd correspondence," e-mail message from e-mail address to MVW, June 2001. Hereinafter cited as "Jerry Floyd." [S509] Fr. Peter Helbron's Greensburg Pennsylvania register., Register of baptisms at Sportsmen's Hall St. Vincent, Latrobe, Pennsylvania.,. Hereinafter cited as Helbron Register. [S513] Bill Hudson, "Floyd Family Correspondence -Bill Hudson," e-mail message from Bill hudson [e-mail address] to MVW, April 2003. Hereinafter cited as "Bill Hudson." [S523] Floyd Family Headstone, MVW file, 100 Beach Dr. # 1801, St. Petersburg, Pinellas County, FL; Bob Bridger, 2003. [S531] Abstracts of Early Deeds of Edgecomb County N.C., 2, n.pub., n.p.. Hereinafter cited as Edgecomb Deed Abstracts. [S534] Clark, Loyalist in the Southern Campagne of the Revolutionary War. . Hereinafter cited as Loyalists in Rev. [S550] Rikke Love, "Rikki Love," e-mail message from unknown author e-mail to Margot Woodrough, Feb 2004. Hereinafter cited as "Rikki Love." [S577] Bill Jones, "Floyd family Virginia to North Carolina - Bill Jones," e-mail message from e-mail address (unknown address) to MVW, January 2006. Hereinafter cited as "Bill Jones." [S601] Dottie Punch, "Dottie Punch - Floyd research," e-mail message from e-mail address (unknown address) to mve, 2007.